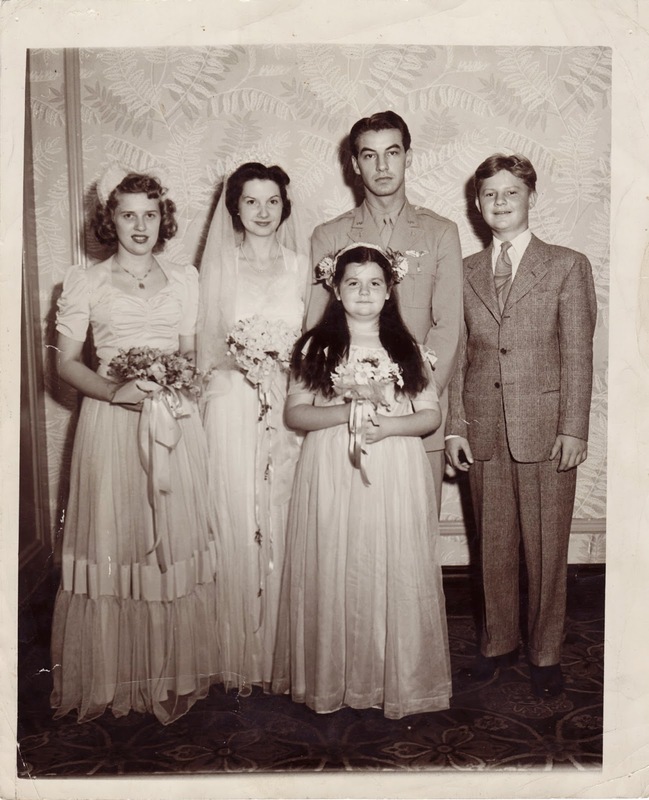 My great uncle Francis Witt Jr. married Mary Lou Murray on August 2, 1944. Shown in this photo on their wedding day are Francis’s younger brother Howard (my grandfather) and the baby of the family, his sister Helen. It is unknown to me who the woman on the right is. Less than a week prior Francis had returned home to Youngstown after being reported missing in action. According to a Vindicator report, how he arrived home was not disclosed (but I can let you in on the secret). Unknown, Mary Lou Murray Witt (1917-2001), Helen Witt (1934-2009), Francis Witt Jr. (1920-2002) and Howard Witt (1929-2001), photograph, taken at unknown location on 2 Aug 1944; digital image, photocopy of original, scanned in 2013 by Joseph Lowry; privately held by Marie Dockry, [address for private use], Austintown, Ohio. Three women and two men, one in a service uniform, appearing for a wedding. Provenance is Marie Dockry to Joseph Lowry.